Skip the grocery store and buy COPYCAT UNCRUSTABLES at home. Make them peanut butter or pizza or with lunchmeat for easy lunch packing! You’re not stuck with the traditional peanut butter and jelly flavor, make any sandwich you like. 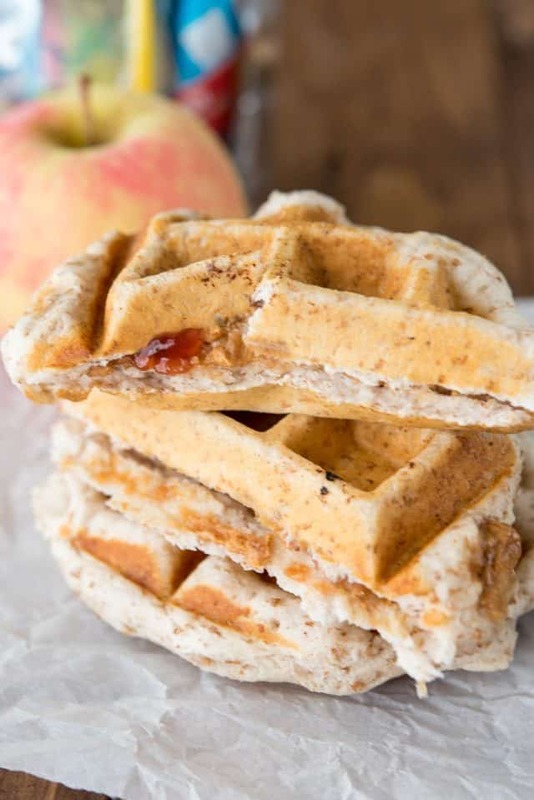 Start with biscuits and a waffle maker and you have easy lunches ready to go anytime! Lunches are always a struggle in our house. Jordan is now in middle school and apparently they don’t sit and eat lunch, they hang out with their friends and snack. The problem is, Jordan needs a full lunch to be able to handle an afternoon of classes…but she wants to fit in and be cool too. 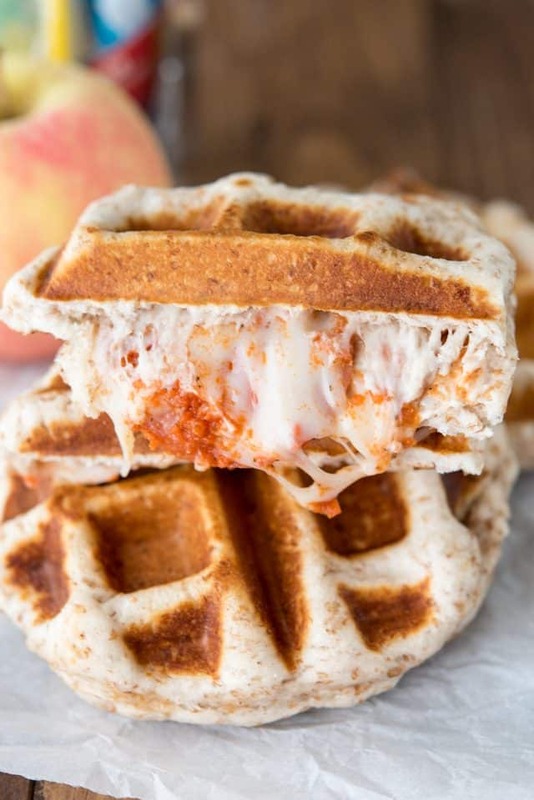 That’s where these Pizza waffles and Copycat Uncrustables come in! We’ve never really liked the store bought Uncrustables. Jordan doesn’t love peanut butter with jelly, plus she can’t take peanut butter to school. This method for making your own Uncrustables is perfect for a picky kid or a kid with allergies because you can make them however you want! By far, Jordan’s favorite one of these is the PIZZA version. Gooey and cheesy, who doesn’t love pizza? If your kids like PB&J, you can make those too or even use turkey and cheese (or any lunchmeat). This recipe is really a method you can use to make your kids happy at lunch. The best part about this recipe is that you can freeze these for later use. I love to freeze them and pop them from the freezer into Jordan’s lunch. By lunchtime they’re thawed and she doesn’t even care that they’re not hot. Copycat Uncrustables can be made in any flavor: pizza, pb&J, or even turkey or ham and cheese. They’re every kids favorite lunch! Start with a refrigerated biscuit dough. I love using Grands! biscuits, but you can use any brand. One can will make 8 sandwiches. Use your favorite fillings: cheese and sauce for pizza, peanut butter and jelly, or lunchmeat and cheese. Cool on a paper towel so they don’t get soggy. Freeze wrapped in a paper towel for up to 1 month. Cool slightly (or completely) before serving. Store in an airtight container for up to 3 days or freeze for up to one month. To reheat, simply microwave until warm. You can also toast them to make them crunchy. Or just place a frozen sandwich in a lunch box the night before and it’ll be defrosted by lunch the next day! Open the can of biscuits and cut each biscuit in half like you’re making a sandwich. Place about 2 teaspoons of pizza sauce on one side of the raw biscuit dough. If desired, top with some cheese and toppings. Place the top raw half of the biscuit on top and pinch the edges to seal. 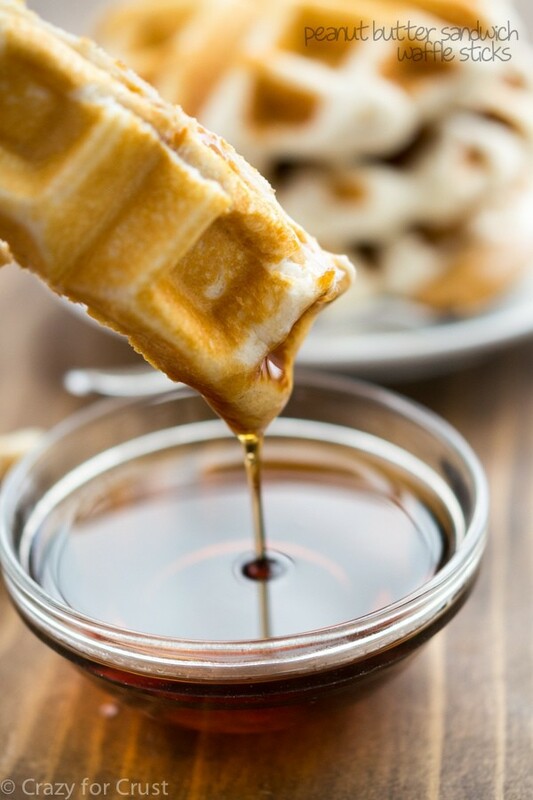 Other ways to make waffle sandwiches: Peanut Butter Banana Honey Waffles by Mom on Timeout or Waffle Maker Grilled Cheese by Fifteen Spatulas. 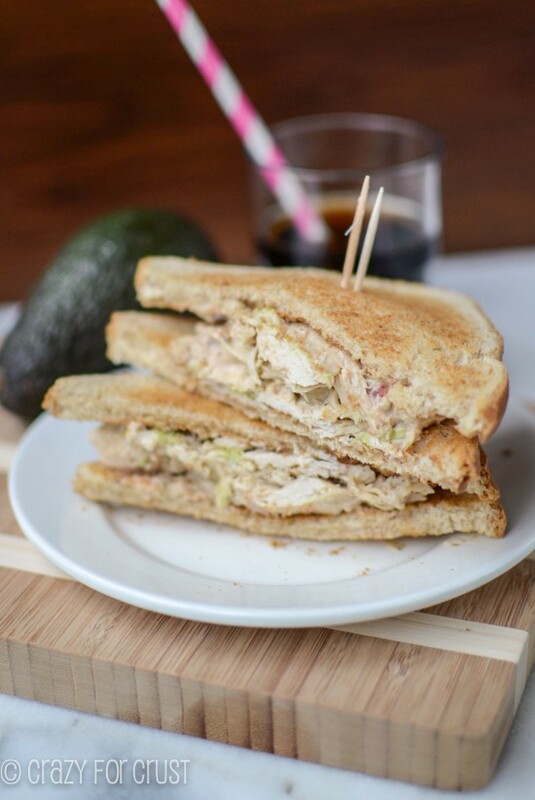 Chicken Avocado Sandwiches are another great lunch idea! Peanut Butter Sandwich Waffle Sticks are great for breakfast or lunch! Wow. I had no idea there were PIZZA uncrustables. That look like waffles. That look like the best lunch ever. Your lunch-making skills are obviously better than you let on. My kids get cheese sandwiches or if they’re lucky, microwaved veggie burgers. These are so much better! Dorothy … I don’t have a waffle maker … is there another way to make these? Hope so! My girl would love these! Patrice, you can probably just make them as directed and then bake them in the oven. They’ll be more biscuit like but still work! I can’t wait to make these! How do you think turkey and cheese would be? This is brilliant! MMMmmm, looks so good. It will be something I will try.